Boasting golf course and lake views, this stately brick and stone-accented mansion in Duluth, GA was built in 2008 and is situated on just over two acres of land. It features approximately 13,800 square feet of living space, with seven bedrooms, eight full and two half bathrooms, two-story foyer with sweeping staircase, elevator, two-story great room with fireplace, formal dining room, butler's pantry, gourmet kitchen with double islands, breakfast room, study loft, U-shaped rear staircase, two-story family room with barrel vault ceiling and fireplace, and two-level paneled home office/library with fireplace. Lower level recreation room with fireplace, second kitchen, wet bar, 10-seat home theater, wine cellar and tasting room, exercise room, and garage parking for five cars. Interior spaces also include an in-law suite with kitchen and sitting room. Outdoor features include a motor court, porte-cochere, covered front porch, terraces, fireplace, patio, free form swimming pool with spa, pavilion with kitchen and fireplace, fire pit, and a waterfall. 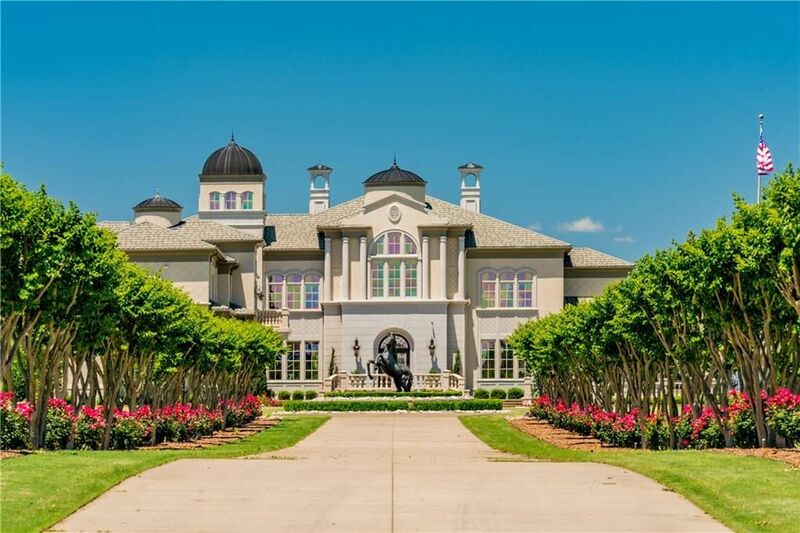 This bold and beautiful stucco mansion in Fort Smith, AR was built in 2005 and is situated on 20 acres of land. It boasts approximately 18,3687 square feet of living space with five bedrooms, five full and four half bathrooms, two-story rotunda-style foyer with double staircase, elevator, two-story great room with stone fireplace, formal dining room, butler's pantry, gourmet kitchen with double islands and stainless steel appliances, breakfast room, rear staircase, family room with wet bar, paneled home office/library with fireplace, 2,400 square foot game room with wet bar, 10-seat home theater, garage parking for nine cars, and much more. Outdoor features include patterned concrete driveway, fountain, motor court, porte-cochere, balconies, expansive open and covered patios, award-winning infinity-edge swimming pool with spa and water features, pool house, and a barn. This jaw-dropping mansion is listed for $10,900,000 with Marshall Yantis of Warnock Real Estate. Set on 14.5 acres of picturesque land in Dallas, TX, this breathtaking limestone mega mansion was built in 1938 and has undergone several modernization updates that make it appealing to today's most discerning buyer. Designed with large-scale entertaining in mind, the stately home features approximately 27,092 square feet of living space with 10 bedrooms, 12 full and five half bathrooms, a two-story foyer with floating staircase, elevator, grand reception hall, banquet-sized formal dining room with fireplace, gourmet kitchen with top-of-the-line appliances, breakfast room, family room with fireplace, sun room, paneled library with fireplace, paneled home office, two wet bars, wine cellar, media/game room with fireplace, 18-seat stadium-style home theater, an additional home theater, seven-car garage, and much more. Outdoor features include a gated entrance, porte-cochere, motor court, open and covered patios, terraces, fountains, greenhouse, rose and vegetable gardens, formal gardens, swimming pool, pool house, tennis court, basketball court, and a creek with waterfall. The property also features a separate two-story guest house. This modernized classic stone mansion is listed for $38,500,000 with Allie Beth Allman of ALLIE BETH ALLMAN & ASSOCIATES. This Wadia Associates-designed stone French Country-inspired mansion in Greenwich, CT was built in 2013 and is situated on just over three acres of land. It features approximately 18,000 square feet of living space over four levels with eight bedrooms, eight full and four half bathrooms, two-story rotunda-style foyer with floating staircase, elevator, formal living and dining rooms with fireplaces, butler's pantry, gourmet kitchen with stainless appliances, breakfast room, rear staircase, family room with fireplace, two-story paneled library with fireplace, four-car garage, and much more. Outdoor features include a gated entrance, porte-coche, motor court, courtyard, patio with fireplace and fountain, additional open and covered patios, loggia, front and rear upper terraces, and an additional fountain. 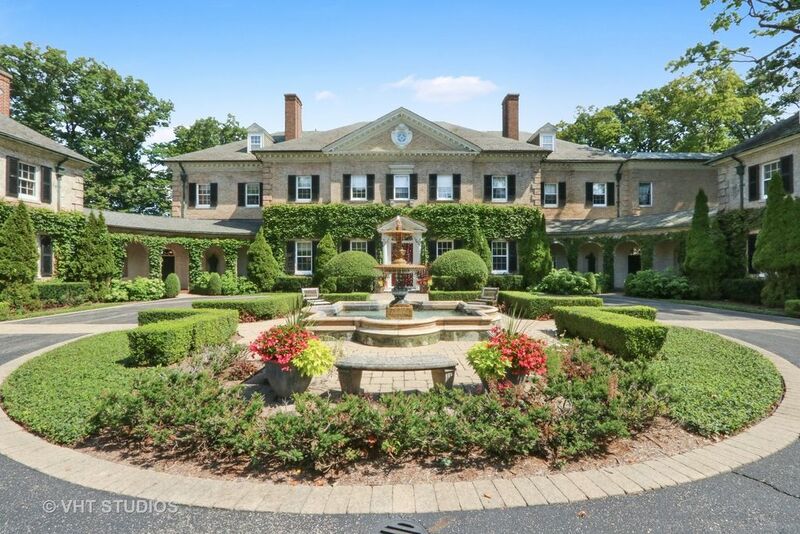 This classic stone mansion is listed for $30,000,000 with Amy Marisa Balducci of SOTHEBY'S INT'L | GREENWICH. 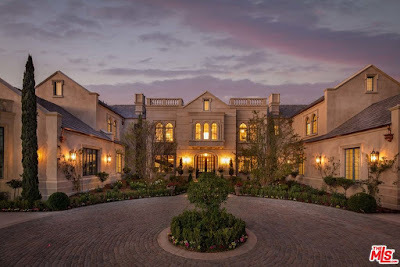 This beautiful Georgian Traditional-style mansion in Beverly Hills, CA was built in 2014 and is situated on two-thirds of an acre of land. It features approximately 18,087 square feet of living space with seven bedrooms, 10 full and four half bathrooms, foyer with floating spiral staircase, formal living and dining rooms with fireplaces, butler's pantry, gourmet kitchen with double islands, breakfast room, family room with fireplace, and a paneled library with wet bar. The expansive lower level includes a recreation room with kitchenette/wet bar, paneled wine cellar with tasting room, media room, home theater, exercise room, massage room, and a five-car garage. Outdoor features include two gated entrances, open and covered terraces, and a swimming pool with spa. This majestic mansion is currently listed for $29,999,999 with Jason Hastings of Pacific Union International. 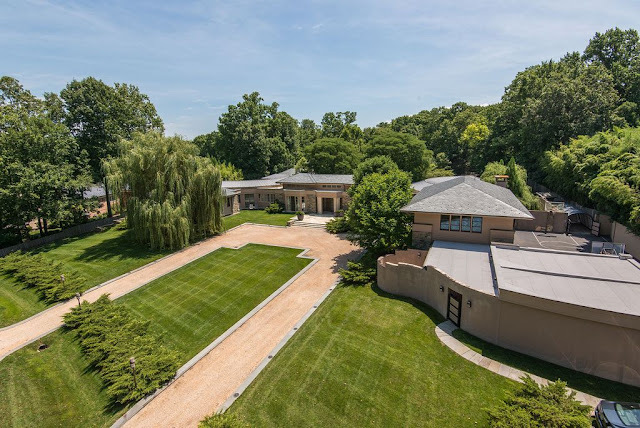 Built in 1991 and situated on just over two acres of resort-like land, this contemporary-style mansion in Rockville, MD is clad in stone and high-grade plank siding. The breathtaking home features approximately 15,022 square feet of living space with seven bedrooms, eight full and four half bathrooms, formal living room with raised ceiling and clerestory windows, expansive gallery with skylight, formal dining room with raised paneled ceiling, gourmet kitchen with huge island and stainless steel appliances, breakfast room, library with fireplace, two-story glass-enclosed stair hall with staircase, recreation room, home gym, wet bar, 12-seat home theater, bowling alley, sun room, and a five-car garage. Outdoor features include a motor court, courtyards, loggia, patios, half-court basketball court, and a 60-foot infinity-edge swimming pool. This past August, when I contacted Debra Johnston (who I refer to as Miss Debra) about being featured in my new blog series 'ADDRESSING THE AGENT', I was very surprised that she 1) responded and 2) agreed! I mean, here's a successful entrepreneur taking time out of her busy schedule to tackle questions presented to her from a relatively unknown blogger. 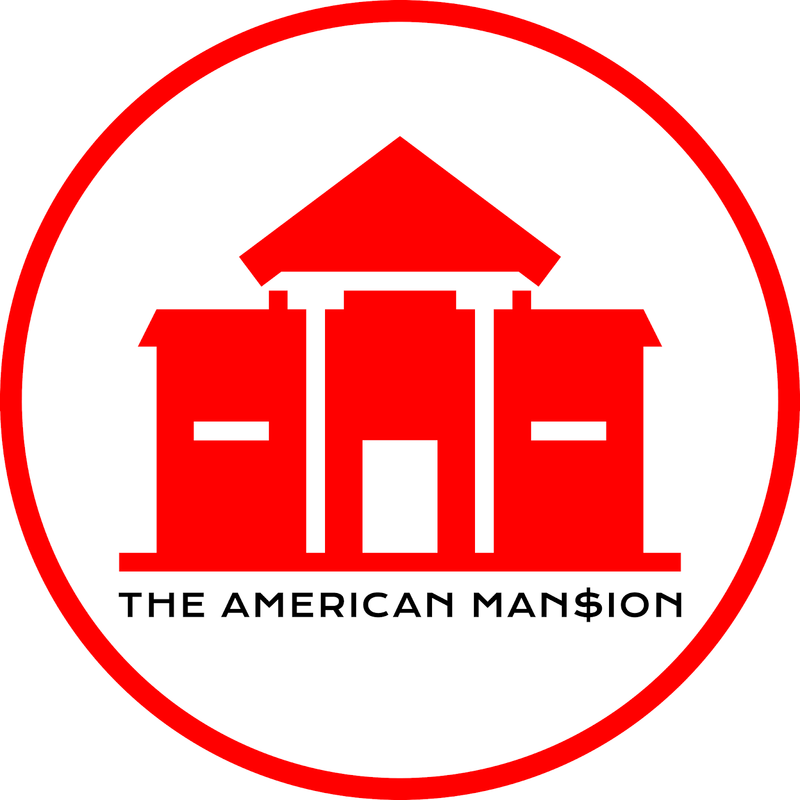 More than a few of her luxury listings have appeared right here on The American Man$ion, so I consider it an honor to be able to share more about her on a personal level. 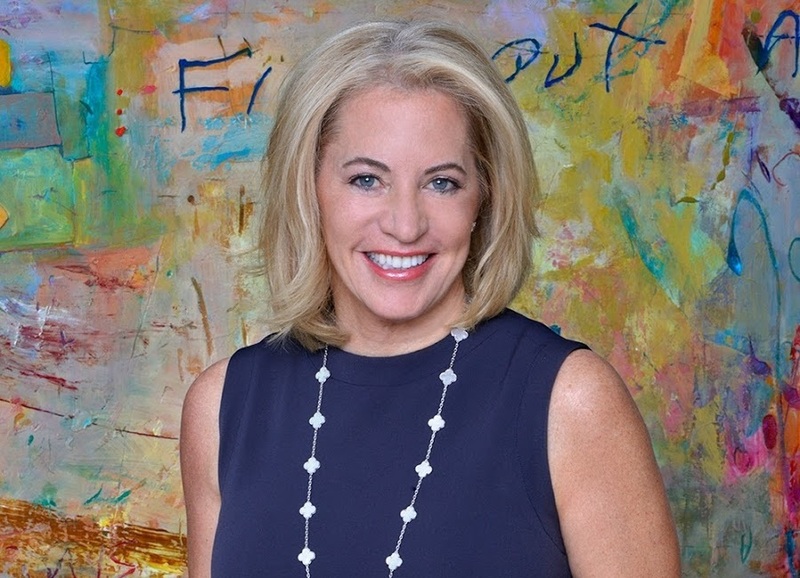 Debra Johnston is one of the most sought after real estate agents in Atlanta, GA and has a clientele network that reaches from Fortune 500 executives to entertainment and film celebrities with a portfolio that is valued north of $50 million. Without further ado, please enjoy this casual Q&A-style interview with Atlanta's super agent Debra Johnston! On October 18, 2018, I posted this freshly completed home on my 'WORTH A MENTION' post. 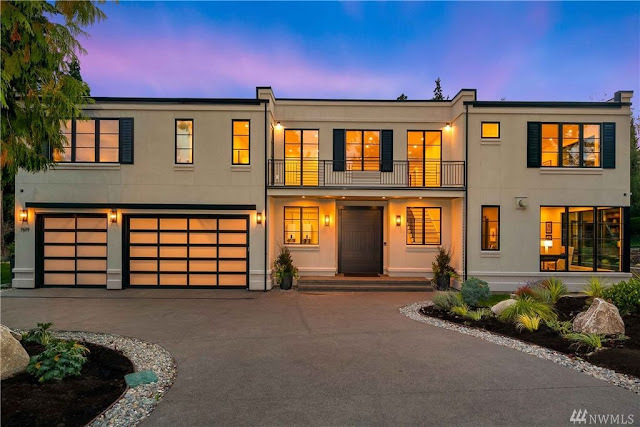 At the time, the Paul McLean-designed residence was reflecting an "OFF MARKET" status on Zillow but apparently that has changed within the past few days and this beauty is in fact on the market! 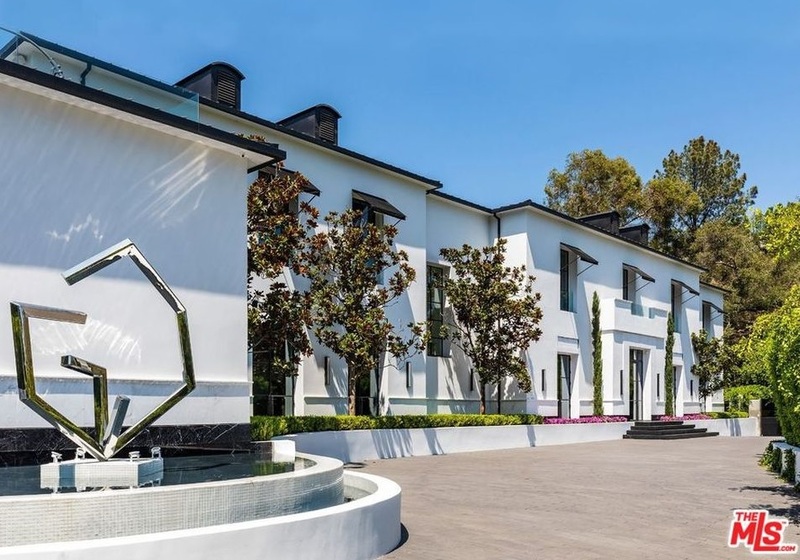 The 27,000 square foot modern mega mansion sits behind a gated entrance and boasts direct golf course views as well as views of the not-so-distant Los Angeles skyline. It has eight king-sized suites and 12 bathrooms. A two-story stair hall has a floating spiral staircase with lighted tread nosing. Well appointed formal living spaces include a living room, family room, ball room, and lounge with wet bar and glass-enclosed wine cellar. The gourmet kitchen was designed with a chef in mind and the banquet-sized dining room is fit for large dinner parties. The decked out home office would make any executive drool and the home theater with snack bar is a moviegoers dream spot. The outdoor features include a motor court, sculpture fountain, expansive rear patio, roof top terrace, and an infinity-edge swimming pool and spa. This contemporary manor is currently listed for $65,000,000 with Williams & Williams Estates Group. Built in 2014 and recreated in 2018 to today's standards, this Mediterranean-inspired mansion with contemporary flair in Scottsdale, AZ is situated on four acres of land and boasts dramatic city and mountain views. Consisting of a main and small guest house, it features a combined total of 14,350 square feet of living space with nine bedrooms, 10 bathrooms, great room with fireplace and sliding glass wall, dining room with wine closet, gourmet kitchen with breakfast bar, secondary kitchen with stainless steel appliances, family room with fireplace (shares see-through fireplace with great room), wet bar, media room with gas fireplace, four-car garage, and much more. Outdoor features include a gated entrance, fountain, motor court, court yard with sculpture fountain, balconies, open and covered patios, cabana with bar, water and fire features, and swimming pool with spa. This desert oasis is currently listed for $26,000,000 with Deborah Beardsley of Silverleaf Realty. Entertainment mogul Tyler Perry was called this Atlanta, GA mega mansion home! 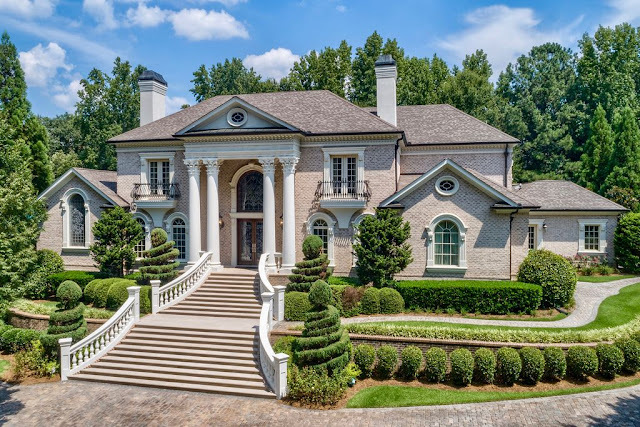 The stately brick and stone French Provincial-style residence was built in 2007 and is situated on 17 acres of pristine park-like land with Chattahoochee River frontage. It features approximately 34,688 square feet of living space with seven bedrooms, nine full and five half bathrooms, two-story foyer with floating double staircase, elevator, two-story great room, formal living room, two-story dining room with fireplace, expansive butler's pantry, chef-inspired gourmet kitchen, rear staircase, two-story family room, two-story home office/library with fireplace, an additional library with fireplace, upper level game room with wet bar, fully finished lower level with recreation, wine cellar with tasting room, 18-seat home theater, ball room with catering kitchen, indoor resistance pool, spa with sauna, fully-equipped home gym, and a five-car garage. Outdoor features include two gated entrances, motor court with fountain, open and covered terraces, patio, resort-style 70,000 gallon infinity-edge swimming pool with spa, formal and informal gardens, and a lighted tennis court. The property also has a guard and guest house. This riverfront mega mansion is currently listed for $25,000,000 with Chase Mizell of Atlanta Fine Homes. This like new four-sided brick mega mansion in Franklin, TN was built in 2009 and situated on just over four acres of land. It comes with all of the bells and whistles that any entertainer would love! The stately home features approximately 22,743 square feet of living space with six bedrooms, eight full and five half bathrooms, two-story foyer with double floating staircase and dome ceiling, elevator, formal living room with fireplace, two-story great room with fireplace and dome ceiling, formal dining room, butler's pantry, gourmet kitchen, breakfast room, rear staircase, two-story family room with fireplace, upper level recreation room with kitchenette, fully finished lower level with recreation room, wet bar, wine cellar, ball room with stage, dine-in home theater, and much more. A six-car garage and pool/guest house complete the main level. Outdoor features include a porte-cochere, motor court, front and rear porticos, expansive patio, and a free form swimming pool with spa. This sprawling mansion is currently listed for $17,900,000 with Bill Henson Jr. of SilverPointe Properties. This resort-like property in Atlanta, GA is situated on 8.4 acres of land and is comprised of a main house, guest cottage, and caretaker's house. The main house is a stately brick and stone mansion that features approximately 15,100 square feet of living space with six bedrooms, eight full and four half bathrooms, two-story foyer with floating spiral staircase, formal living room, formal dining room with fireplace, butler's pantry, gourmet kitchen stainless steel appliances and breakfast bar, breakfast room with vaulted ceiling, rear staircase, family room, sun room, paneled home office with box beam ceiling, lower level recreation room, wine closet, kitchenette, media room, billiards room, wet bar, 10-seat home theater, home gym, spa with steam shower and sauna, and a four-car garage on the main level. Outdoor features include front and rear gated entrances, motor court, fountain, covered front porch, balcony, rear flagstone patio, dining pavilion with BBQ kitchen, swimming pool with spa, gas fire pit, koi pond with bridge, formal garden with pavilion, gazebo, waterfalls, lake, and a tennis court. This picturesque estate is currently listed for $7,950,000 with Debra Johnston of Berkshire Hathaway HomeServices. 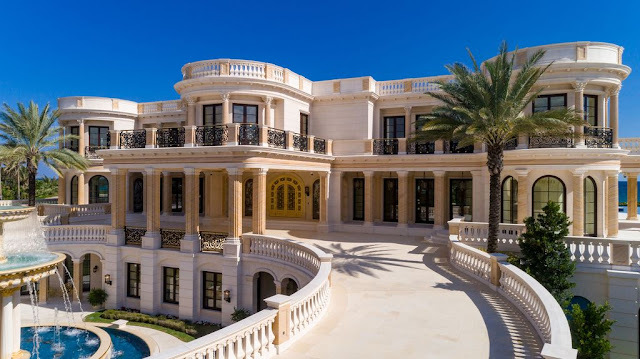 Dubbed "Playa Vista Isle", this newly built Neoclassical-inspired oceanfront mega mansion in Hillsboro Beach, FL was once listed as the most expensive property in the U.S. It is situated on five of acres of land and boasts nearly 600 linear feet of ocean and Intracoastal frontage. With a combined 60,000 square feet, the Floridian palace features 30,000+ square feet of living space with 11 bedrooms, 12 full and six half bathrooms, a grand two-story foyer with double staircase, elevator, formal living room with fireplace, formal dining room with hand-painted barrel vault ceiling, butler's pantry, gourmet kitchen with mahogany cabinets, breakfast room, family room with mahogany-framed salt water aquarium, his and her home offices, and a game/conference room. The lower level features a temperature-controlled 3,000+- bottle wine room, a multipurpose room, an 18-seat IMAX home theater with 15'x23' screen, and a climate-controlled subterranean garage that can accommodate up to 20 vehicles. Notable outdoor features include two gated entrances, motor court, porte-cochere, formal gardens, expansive terraces, a 4,500 square foot infinity-edge swimming pool with 12' waterfall, water slide, and swim-up bar, and two deep-water docks. The breathtaking oceanfront abode is currently listed for $139,000,000 with Mayi de la Vega of ONE Sotheby's International Realty. Built in 2002 and situated on just over five acres of land in McLean, VA, this stately stone mansion showcases impeccable craftsmanship from top to bottom and inside out. The Georgian-style home features 16,000+ square feet of living space with seven bedrooms, eight full and two half bathrooms, a mahogany paneled two-story foyer with floating staircase, elevator, formal living and dining rooms with fireplaces, two-story great room with fireplace and box beam ceiling, country-style kitchen with double islands, breakfast room, family room with fireplace, and paneled library with fireplace. The expansive lower level includes a recreation with wet bar, family room with fireplace, game room, wine closet, a 10-seat home theater, and a four-car garage. Outdoor features include two gated entrances, a motor court, fountain, front terraces, open and covered rear terraces, patio, swimming pool and spa, and a pergola. Designed by Paul McLean, this freshly completed modern mega mansion was on the market but for a few weeks before it was picked up. The 27,000 square foot estate sits behind a gated entrance and boasts direct golf course views as well as views of the not-so-distant Los Angeles skyline. It has eight king-sized suites and 12 bathrooms. A two-story stair hall has a floating spiral staircase with lighted tread nosing. Well appointed formal living spaces include a living room, family room, ball room, and lounge with wet bar and glass-enclosed wine cellar. The gourmet kitchen was designed with a chef in mind and the banquet-sized dining room is fit for large dinner parties. The decked out home office would make any executive drool and the home theater with snack bar is a moviegoers dream spot. The outdoor features include a motor court, sculpture fountain, expansive rear patio, roof top terrace, and an infinity-edge swimming pool and spa. 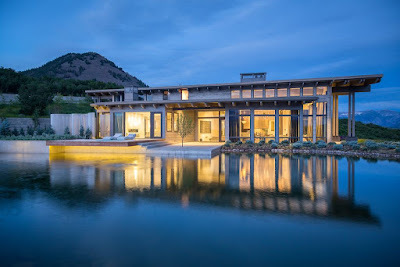 The final sale price of this contemporary manor is unknown but it was last listed in early-October 2018 for $65,000,000 with Williams & Williams Estates Group. 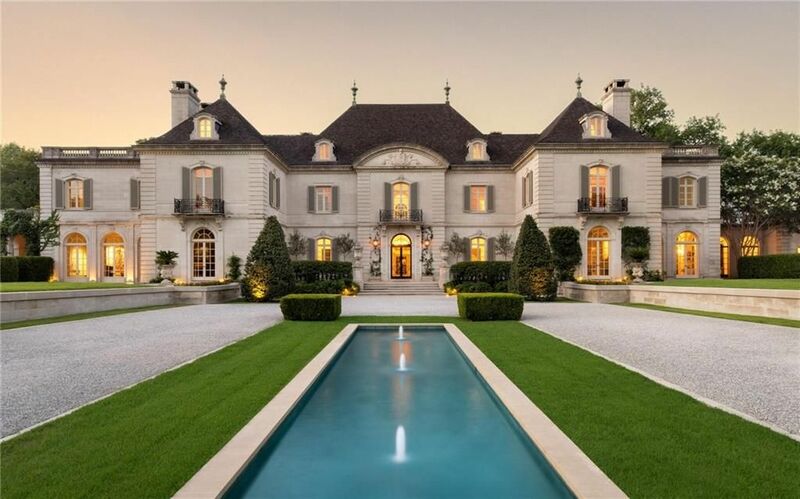 This beautiful French-style mansion in Toronto, Canada features approximately 12,050 square feet of living space. It has five bedrooms, six full and three half bathrooms, two-story foyer with a cascading staircase, an inaner foyer/music room, formal living room with fireplace, formal dining room, butler's pantry, gourmet kitchen with breakfast bar island, breakfast room, rear staircase, family room with fireplace, and a library/home office with fireplace. The finished lower level features a recreation room, cards room, exercise room, wine cellar, indoor swimming pool with steam shower and sauna area, and a subterranean three-car garage. Outdoor features include a gated entrance, terrace, gazebo, and a tennis court. This stately mansion is currently listed for $10,500,000 CAD with Fran Bennett of Trilogy Agents. This stately stone and limestone mansion in Northfield, IL was built in 2004 and is situated on 1.15 acres of land. It features approximately 11,500 square feet of living space with five bedrooms, six full and three half bathrooms, two-story foyer with floating staircase, formal living and dining rooms with fireplaces, chef-inspired gourmet kitchen with breakfast bar and see-through fireplace which it shares with the family room, breakfast room, rear staircase, paneled library with fireplace, wine cellar, home theater, indoor lap pool, exercise room, wet/dry saunas, golf simulator, three-car garage, and so much more. Outdoor features include a motor court, expansive flagstone patio, and a pavilion. This stone mansion is listed for $2,795,000 with Darragh Landry of @properties. This newly built brick and stone-accented Georgian-style mansion in Arcadia, CA is situated on 1.4 acres of land and boasts a classic build with a modern touch. It features approximately 16,627 square feet of living space with seven bedrooms (including first and second floor master bedrooms), nine full and two half bathrooms, two-story foyer with floating double staircase, elevator, formal living room with fireplace, sitting room, formal dining room, main gourmet and galley kitchens with stainless steel appliances, breakfast room, rear staircase, two-story family room with wet bar, paneled home office, 13-seat home theater, 1,500-bottle wine cellar and adjoining tasting room, exercise room, sauna, four-car garage, and so much more. Outdoor features include a motor court, front terrace, balconies, patios, BBQ kitchen, infinity-edge swimming pool with spa, and tennis court. The property also features a pool house with bar, billiards area, and living area with fireplace. This newly built French Normandy-style mega mansion in Palm Beach, FL is situated on one acre of land and boasts 240+ feet of ocean frontage. It was designed by Frederick L. Bissinger Jr. and Smith and Moore Architects and is owned by entrepreneur Vahan Gureghian. The oceanfront residence features approximately 35,993 square feet of living space with eight bedrooms, seven full and 10 half bathrooms, two-story foyer with floating staircase, elevator, three additional staircases, two-story great room with fireplace, formal dining room, butler's pantry, gourmet kitchen, family room with fireplace, library, home office for her, billiards room with wet bar, wine cellar/tasting room, octagonal-shaped home theater, play room, lower level game room, bowling alley, exercise room, massage room, barber shop, and two four-car garages. Outdoor features include two gated entrances, motor courts, fountain, front terrace, two loggias, BBQ kitchen, upper level terrace, two decks, and an infinity-edge swimming pool with spa. 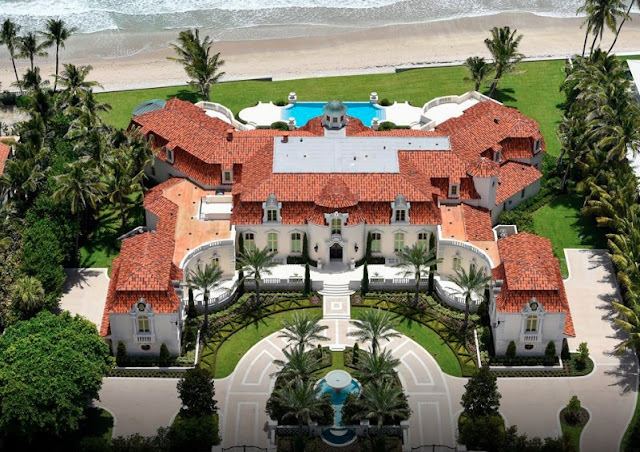 This oceanfront mansion is listed for $59,900,000 with Christian Angle of Christian Angle Real Estate. 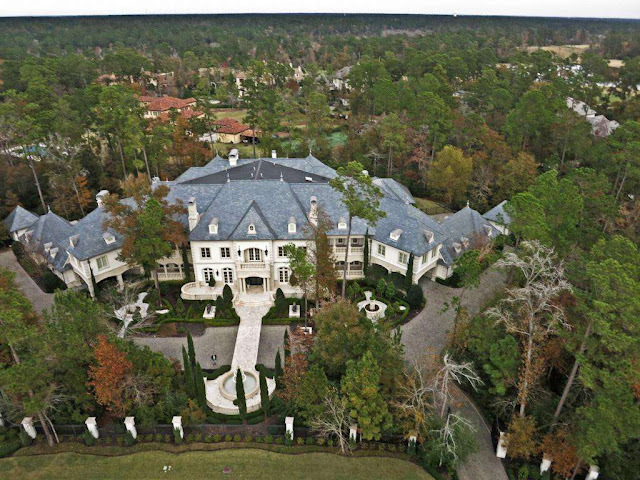 This French Renaissance estate in The Woodlands, TX is situated on just over four acres of land with easy access to the neighboring golf course. Boasting 30,717 square feet of living space, this stately mansion features a bevy of grand spaces including a two-story foyer, two large executive-style libraries, banquet-sized dining room, chef-inspired kitchen, catering kitchen with walk-in cooler, wine room, home theater, a third floor gentleman's room with wet bar, a 1950s-themed soda shop with checkered dance floor and jukebox. Eight of the 10 bedrooms have inclusive balcony access and all 10 bedrooms have bathrooms. The home also sports three elevators, two one-bedroom apartments, a pool house, salon, six-car garage, and so much more. In 2015, listing price of this mega home was $16,000,000 and included all furnishings. European-inspired with Chattahoochee River frontage, this stately four-sided brick mansion in Duluth, GA is situated on just under an acre of land behind the gates of the St. Ives Country Club community. It features approximately 13,663 square feet of living space with five bedrooms, five full and five half bathrooms, two-story foyer with floating winding staircase, elevator, additional rear staircase, two-story great room with fireplace, formal dining room, butler's pantry, chef-inspired gourmet kitchen with stainless steel appliances and breakfast bar, breakfast room, family room with vaulted ceiling and fireplace, two-story paneled library/home office, an expansive lower level with foyer, home theater, billiards room, second kitchen, wine cellar with hidden door, home gym, indoor pool with fireplace, steam shower/sauna room, and a four-car garage that completes the main level. Outdoor features include a motor court, covered front porch, Juliet balconies, covered patio with fireplace, built-in BBQ station, and a spa with fountain. 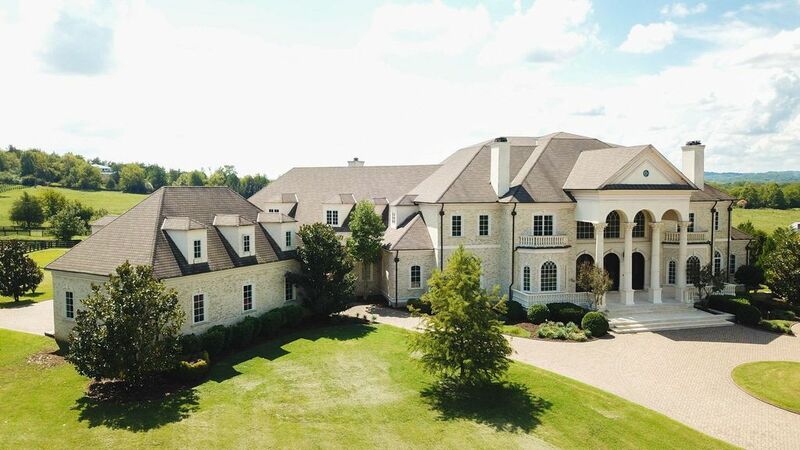 This riverfront mansion is currently listed for $2,790,000 with Christopher McCarley of Atlanta Fine Homes. Freshly constructed and situated on just under an acre of land, this beautiful contemporary-style mansion in Medina, WA sits right in between Overlake Golf and Country Club and the shores of Lake Washington. It features approximately 8,473 square feet of living space with seven bedrooms, seven bathrooms, two-story foyer with U-shaped staircase, formal dining room, an open concept space that includes a family room with fireplace, a gourmet kitchen with two cook areas and elevated breakfast bar, and a breakfast room. The interior also sports a polished home office with gas fireplace and an expansive lower level with wine cellar, recreation room with wet bar, home theater, yoga room, and spa with massage area, sauna, and shower. The main level also features a three-car garage. Outdoor features include a front balcony, deck, open and covered patios, and a tennis court. This newly built home is currently listed for $7,300,000 with Galya Kirstine of Compass. Resembling the chateaus of the European countrysides, this beautiful stucco and stone mansion in Carmel, IN was built in 2006 and is situated on .71 acres of land with amazing golf course and pond views. It features approximately 12,927 square feet of living space with five bedrooms, five full and two half bathrooms, foyer with two-story stair hall and floating staircase, elevator, formal living room with fireplace, formal dining room, butler's pantry, gourmet kitchen with stainless steel appliances, breakfast room, wet bar, family room, paneled home office/library with fireplace, lower level recreation room, billiards room, home theater, and exercise room, and a four-car garage back on the main level. Outdoor features include a motor court, covered front porch, loggia with fireplace and BBQ kitchen, patio, and a terrace. 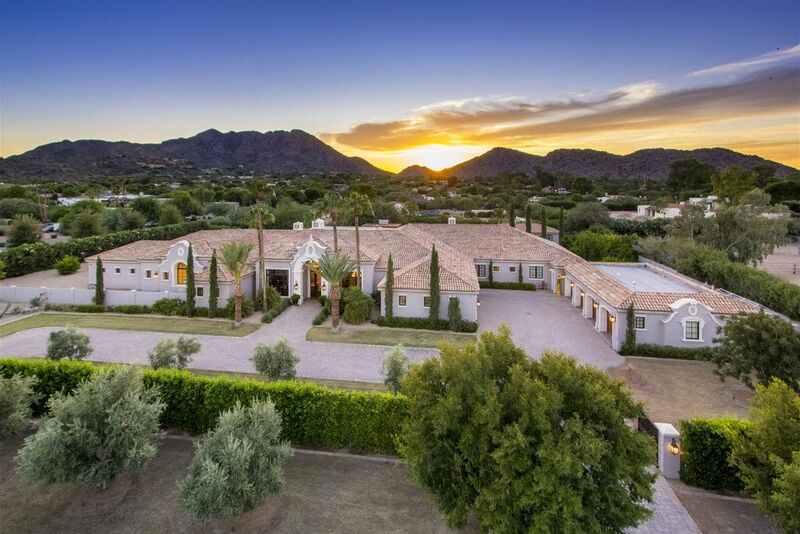 This lovely golf course mansion is currently listed for $2,490,000 with Jay O'Neil of Encore | Sotheby's International Realty. This sprawling Tuscan-inspired mansion in Paradise Valley, AZ was built in 2015 and is situated on just under two acres of land. Boasting an open floor plan, the one-level home features a total of 11,135 square feet (including detached guest house) of living space with seven bedrooms, eight full and two half bathrooms, formal living room with fireplace, formal dining room, butler's pantry, kitchen with breakfast area, family room with fireplace, paneled library with fireplace, an additional home office located in master wing, home theater, exercise room, and garage parking for eight cars. Outdoor features include a gated entrance, covered front porch, rear patios, BBQ kitchen, cabana with fireplace, and edgeless swimming pool with spa, and a putting green. The guest house features a bedroom, living area with fireplace, and kitchen. 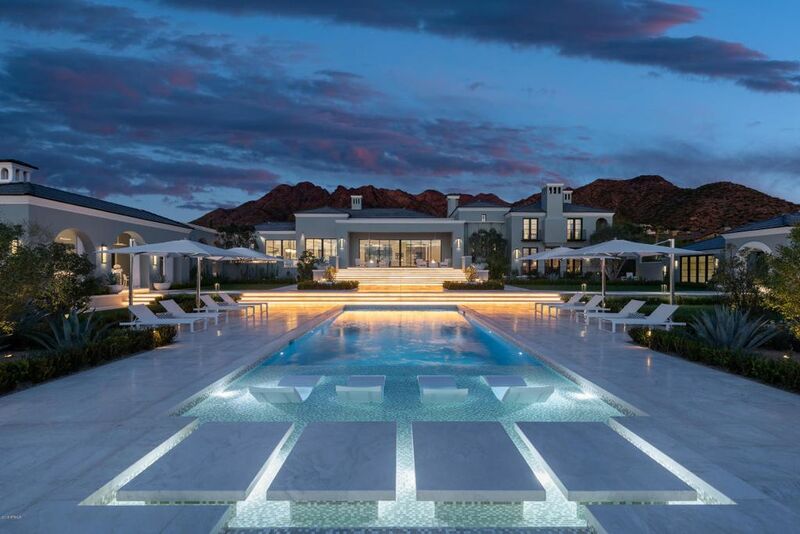 This desert mansion is currently listed for $5,999,500 with Thomas Patrick O'Leary of Sotheby's International Realty. Nineties adult-contemporary music star Richard Marx recently slashed the price on his lakefront brick estate. Situated on five acres of land, the stately home was designed by David Adler and built in 1931 and boasts over 400' of waterfrontage along Lake Michigan. It features approximately 29,745 square feet of living space with seven bedrooms, eight full and six half bathrooms, gallery with two-story stair hall with floating staircase, two additional staircases, dressing rooms located right and left of vestibule, formal living and dining rooms with fireplaces, L-shaped gourmet kitchen with breakfast bar, breakfast room, family room with fireplace, sun room with fireplace, two libraries with fireplaces, second floor sitting room with fireplace and kitchenette, home theater with vaulted ceiling, third floor exercise and family rooms, lower level recreation room with wet bar, garage parking for eight cars, and much more. Outdoor features include a gated entrance, motor courts, covered front porches, fountain, rear patios, and a fire pit. The property also includes a detached recording studio with a kitchen, family room, and two bedrooms. This massive lakefront mansion is currently listed for $8,995,000 with Andra O'Neill of Premier Listing Showcase. Clad in brick with a dash of stone, this stately French Provincial-style mansion in McLean, VA was built in 2008 and is situated on 1.21 acres of finely manicured land. It features approximately 13,258 square feet of living space with six bedrooms, nine full and two half bathrooms, two-story foyer with winding floating staircase, elevator, formal living and dining rooms, solarium with fireplace, butler's pantry, gourmet kitchen with large center island and stainless steel appliances, breakfast room with deck access, family room with fireplace, paneled library with fireplace, walkout lower level with recreation room with wet bar and fireplace, home theater, and more. The main level also features a four-car garage. Outdoor features include a gated entrance, motor court, covered front porches, rear decks, terrace, patios, English garden with fountain, swimming pool with fountain jets, and a pavilion with kitchen and fireplace. This mansion is currently listed for $6,995,000 with Daniel Heider of TTR Sotheby's International Realty. Located in Boca Raton, FL and situated on an acre of land with 288' of south-facing waterfrontage, this Mediterranean-style mansion was built in 1972 and completely modernized in 2016 by renowned designer Susan Connor of P&H Interiors. It features approximately 16,062 square feet of living space with six bedrooms, eight full and one half bathrooms, two-story foyer with floating staircase, elevator, two-story great room, formal dining room, butler's pantry, gourmet kitchen with stainless steel appliances, breakfast area, family room with vaulted ceiling, media/billiards room with wet bar, paneled home office/library, and a four-car garage. Outdoor features include two gated entrances, motor court, covered front porch, front terrace, covered balcony, loggia with BBQ kitchen, patio, swimming pool with spa, lap pool, gazebo, tennis court, and dock. This waterfront mansion is currently listed for $9,975,000 with Rochelle LeCavalier of Pink Palm Properties. Built in 2015 and situated on 35 acres of land offering panoramic views of neighboring snow-capped peaks, this contemporary home represents the ultimate in resort-style mountain living. The rustic Telluride, CO mansion features approximately 12,452 square feet of living space with six bedrooms and eight full and one half bathrooms. The open floor plan with its soaring ceilings throughout, boasts spaces such as an expansive great room, dining room with fireplace, gourmet kitchen with breakfast bar island, a home theater, salon, a spa, exercise room, upper level lounge, and much more. There is also a four-car garage on the main level of the house. Outdoor features include a gated entrance, motor court, covered front porch, covered and open terraces, decks, patio, balcony, kitchen with fireplace, hot tub, fire pit, and a pond. This mansion is currently listed for $29,500,000 with Bill Fandel of Compass | Telluride. This 18-year-old French-inspired brick and stone mansion in Great Falls, VA is situated on five private acres of land boasting some of the areas finest landscaping. The stately home features approximately 12,935 square feet of living space with five bedrooms, five full and three half bathrooms, two-story foyer with winding staircase, formal living and dining rooms with fireplaces, two-story great room with fireplace, butler's pantry, gourmet kitchen with stainless steel appliances, breakfast room, wood paneled home office/library with fireplace, an expansive lower level that includes a recreation room with fireplace and media center, wet bar, second kitchen, billiards room, fitness studio, family room, and sun room. There is also a three-car garage on the main level. Outdoor features include a gated entrance, porte-cochere, motor court, terrace, covered porch, patios, formal gardens, fireplace, and a swimming pool with spa. This mansion is currently listed for $5,400,000 with Penny Yerks of The Yerks Team. Built in 2016 and situated on 2.45 acres of land in Bradbury, CA, this stunning Tudor-style estate boasts main and guest houses offering combined 16,515 square feet of living space with a total of 10 bedrooms and 10 full and three half bathrooms. With 14,017 square feet of living space under its roof, the main house features a two-story foyer with floating spiral staircase, elevator, two-story great room, formal dining room, gourmet kitchen with double islands and breakfast area, family room with wet bar, two-story home office/library, wine cellar/tasting room, home theater, exercise room with sauna, and garage parking for four vehicles. The guest house has 2,498 square feet of living space with bedrooms, bathrooms, living area, and kitchen. Outdoor features include a gated entrance, motor court, covered and open terraces, patio, loggia with cathedral ceiling and fireplace, fire pit, formal walkways and gardens, sport court, and a swimming pool with spa. This Italian Villla-inspired mansion in Pleasanton, CA was built in 2002 and is situated on a half acre of land overlooking the 18th hole of Ruby Hill's golf course. It features approximately 8,600 square feet of living space with six bedrooms, six full and two half bathrooms, two-story foyer with Y-shaped staircase, formal living and dining rooms with front terrace access, butler's pantry, gourmet kitchen with barrel vault ceiling and breakfast bar island, breakfast area, family room with fireplace and media center, wet bar, rear staircase, two home offices, custom wine grotto, second floor sitting room, exercise room, four-car garage, and much more. Outdoor features include a motor court, covered and open front and rear terraces, and a patio. The stunning mansion is currently listed for $5,500,000 million with Robert Gibbons of Foundation Real Estate. Custom built in 2002, this Tudor-style stone mansion in Winnetka, IL features approximately 10,400 square feet of living space with six bedrooms and five full and two half bathrooms. Its open floor plan boasts a rotunda-inspired two-story foyer with floating winding staircase and center skylight, formal living and dining rooms, gourmet kitchen with quartz counters and stainless steel appliances, breakfast room, family room with fireplace, wood paneled library, and a three-car garage. The expansive lower level features a wine cellar, recreation room, media room, huge home office, and exercise room. Outdoor features include a motor court, front balcony, patio, and freestanding stone waterfall. 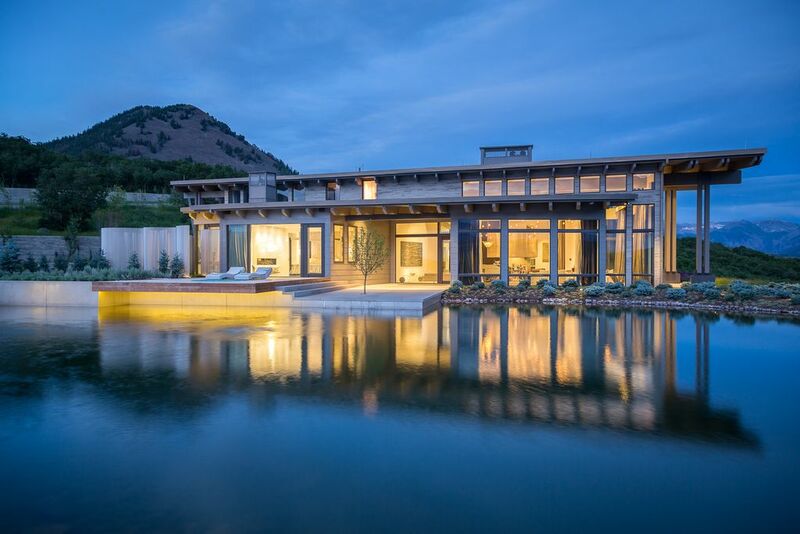 The home is currently listed for $2,980,000 with Linda Jacobson of Premier Listing Showcase. 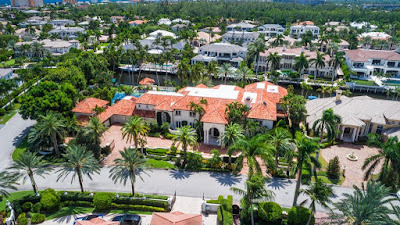 Built in 1996 and situated on just over an acre of land in a guard-gated community, this Mediterranean-style mansion in Coral Gables, FL boasts expansive 119 feet deep water frontage and uninterrupted Biscayne Bay views. It features approximately 15,563 square feet of living space with seven bedrooms, seven full and two half bathrooms, two-story foyer with floating staircase, elevator, two-story great room with floor-to-ceiling fireplace, formal dining room with built-in serving station, butler's pantry, gourmet kitchen with breakfast bar, breakfast room, recreation room with wet bar, media room, home office, home gym, three-car garage with three lifts, and much more. The maid's quarter has one bedroom, one bathroom, living area, and kitchenette. Outdoor features include two gated entrances, a motor court, porte-cochere, rear balconies, terrace, covered and open patios, swimming pool with spa and separate water feature, and a private dock. It is listed for $13,495,000 by Jorge Uribe of Sotheby's International Realty.